Hundreds Attend Inaugural Gathering of SF Team Headed to Montreal! The Cafe on Market Street in the Castro was jam-packed with Equipe SF athletes, artists, dancers, volunteers, activists, and supporters during our Welcome and Outgames Registration Party on Saturday night, October 22nd. It was standing room only at the popular club, which served as host venue for the very first gathering of our Bay Area team headed to Montreal next summer. Many sports and cultural activities were represented, including: swimming, softball, volleyball, marathon, track and field, tennis, biking, dragon boat racing, race walking, badminton, physique, bridge, choral, square dancing, country western dancing, rowing, diving, basketball, synchronized swimming, racquetball, beach volleyball, golf, table tennis, wrestling, gay rights conference, and martial arts, among others! However, it was the triathletes that produced the big winner of the night, as Kathy Fleming of San Francisco won the Grand Prize Drawing: a free round-trip ticket to Montreal on Air Canada! Way to go Kathy! Click Here For More Pics of the Party! Montreal Outgames Registrations Closing in on 10,000 Paid Participants! As of 4 November 2005, there are 9,480 paid registrants for the 1st World Outgames Montreal 2006. This number includes only those people that have registered and sent payment to the Montreal Outgames. This is also a record number of people that have signed up for any international GLBT sport and cultural event 9 months before the opening ceremonies. About half are from North America, and one third are from Europe. Equipe SF Promotes New Outgames Event: The 2006 Outgames Bear & Leather Festival! Some members of Equipe SF have been busy, helping to promote our team to new and prospective members at the International Gay & Lesbian Travel Expo (held at the Nikko Hotel in San Francisco), and at the Montreal Outgames booth which was part of the 2005 Folsom Street Fair. The Montreal Outgames have added another cultural component to the 2006 line-up: An entire week of fun and exciting Bear and Leather Festival activities! Local participants will march with Equipe SF in opening and closing ceremonies, and will also compete in special events designed exclusively for the International Bear and Leather Communities. Outgames Montreal 2006 Mission Accomplished! The success of next year's Outgames is very real and is growing stronger day by day. 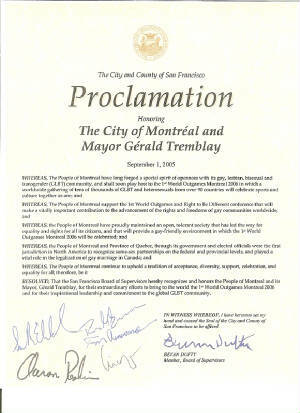 “Eleven months before the Montréal 2006 Outgames, we can now guarantee that this event will be held according to plan. Registrations are going very well, our finances has been secured according to our objectives, and our sports venues are ready. The dream is about to become reality!” — Mark Tewksbury, Montréal 2006 Co-President, Sept 2005. 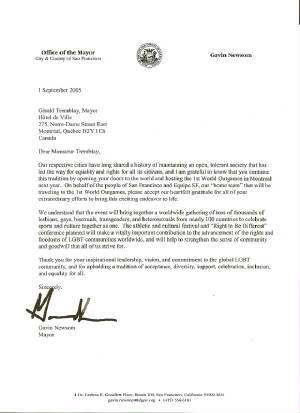 The capital of Denmark, Copenhagen, has been chosen by GLISA to host the next World Outgames in 2009. During a press conference at Montréal’s City Hall, Mayor Gérald Tremblay and the re-elected co-presidents of GLISA, Ms. Catherine Meade and Mr. Thomas Dolan, presented the GLISA banner to Ms. Pernille Vange, representative of the Mayor of Copenhagen, Mr. Lars Engberg. Write to us at EquipeSF1@yahoo.com if you have a hot news flash or question.